1. Place the steak in a bowl with 2 tbsp sweet chilli sauce and marinate for 15 minutes, then thread onto 8 small skewers. 2. Toss the peppers and salad onions in oil and place on a barbecue for 8-10 minutes for the peppers and 4-5 minutes for the onions, turning once until softened and slightly charred. Add the beef skewers to the barbecue and cook for 4-5 minutes or according to taste, turning once. 3. Warm the tortillas on the barbecue for 1 minute. 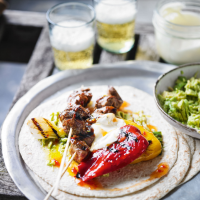 Smash the avocados and spread over the tortillas, top each with a pepper, onion and a beef skewer, drizzle with more sweet chilli sauce and a spoonful of soured cream. This recipe was first published in Thu May 25 10:02:00 BST 2017.